Much detail is put into tents to accommodate standard events; this same level of intricacy is used when designing structures for other situations. Through analyzing material weights and easy-of-use frame aspects Celina has hit upon a quick-erect shelter that is perfect for longer-term and high-wear situations. But what has all this got to do with Celina Industries? With tent manufacturing comes much information that is very common in the community – the tent ideas and designs are fairly standard. And when you think about it, the stresses that most tents used in humanitarian efforts weather are anything but common. Down to the fabric that makes up the walls, roof, and floor, Celina Industries has more experience with a wider range of materials than is common in the event industry. Materials used for tensile strength, fabric with exceptional weather resistance, and the processes to ensure that all applicable fabrics can be assembled into a useable and worthwhile structure is at our disposal. Experience in building more spec-stringent products is a wealth of knowledge that can be combined with standard tent engineering. This isn’t meant to convey that normal party tents aren’t obsessively reviewed before put into production – they are. When you begin to plan a structure that is both a tent and a long-term installation, there is much more to be figured out. Window mesh and covers are required for air flow that can be covered in the event of storms, easily-adjustable connections that can also be easily replaced if they fail, and framework that is both very strong and easily assembled without massive site testing are all consideration that require attention at one time or another. Celina Industries combining with Celina Tent has hit on a design that provides the maximum amount of safety and stability. 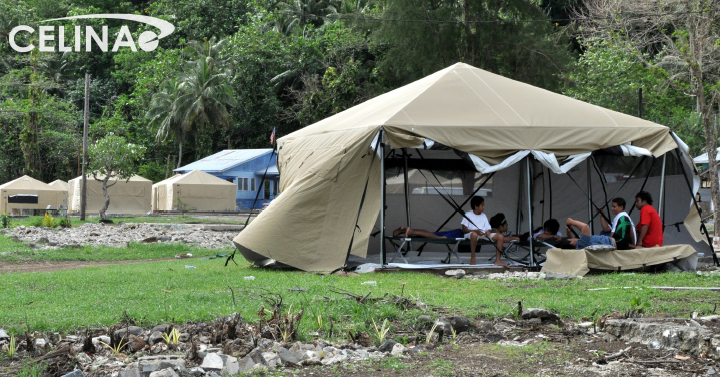 All of the aspects worked into the Humanitarian General Purpose Tent System are there to help provide a modicum of comfort in situations where comfort is in short supply. More in-depth information on the HGPTS can be found on our sister site GetTent.com – be sure to check out our materials and design info pages here on CelinaIndustries as well.